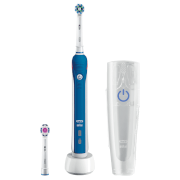 The Oral-B Pro4000 X Action Toothbrush is part of the SmartSeries range, which offers advanced Bluetooth technology to deliver targeted guidance for a unique brushing experience. 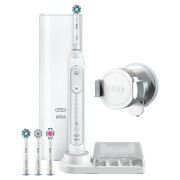 The electric toothbrush works in conjunction with the Oral B smartphone app to monitor your brushing, providing tailored guidance based on your brushing habits and routines. A sensor pressure warns if you’re brushing too hard, and there are specific ‘Dental Care Journey’ options to help you reach specific goals such as whiter teeth or fresher breath. Get connected with your oral hygiene and achieve cleaner than clean results. Modes: Daily Clean (Comprehensive everyday cleaning), Sensitive (Lower speed for a gentle clean), Gum Care (Gently stimulates gums).